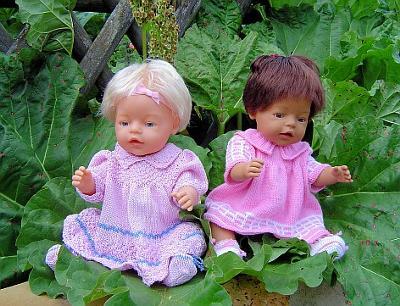 I have finally found what I was looking for a long time: How to knit doll clothes with fine wool and beautiful patterns. First, I translated the pattern into German, then I knitted it and was so happy that the clothes looked really as in Maalfrid's pictures. Here Sophie and Babette are sitting with their new summer clothes on the rhubarb leaves and are waiting for the summer and the butterflies. Bettina do not only translate our patterns to German in an excellent way, she is an excellent knitter too. You've done a lovely job of knitting these two dresses. They are wonderfully made and I'm very impressed that you preserved with translating the patterns. Thank you Bettina for sharing. You have done a wonderful job! The dresses fits your dolls perfectly! You have done a beautiful job. Sophie and Babette look so happy with their new outfits and I don't blame them one bit. Thank you for sharing this photo with us. It is so inspiring to see.